The Red Bull protégé claimed his fourth GP2 pole of the season in today’s dramatic Qualifying session at Sepang International Circuit. 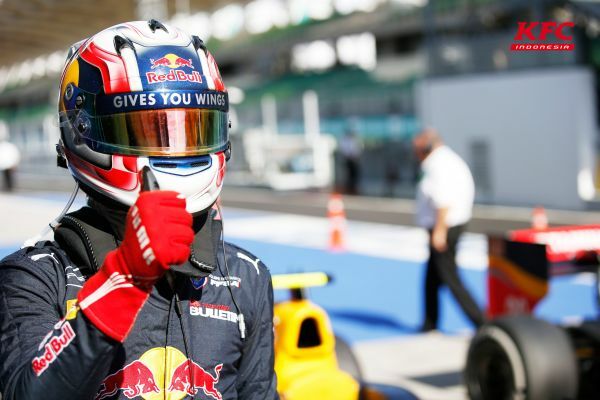 Pierre Gasly clocked a laptime of 1:42.181 on his first flying lap and on his first stint. He denied teammate Antonio Giovinazzi by 0.082s in what is PREMA Racing’s third front row lock out. Raffaele Marciello completed the top three. The session opened under blue skies and in scorching temperatures as the twenty-one cars took to the track on Medium Pirelli tyres. Norman Nato was the first man to dip under 1m43s, but Nobuharu Matsushita went faster to take P1. It was then Sergey Sirotkin who improved on his teammate’s laptime by 0.095s to go top. Gasly however would not let his rivals shine today: he went quickest on his first flying lap, and his laptime of 1:42.181 would not be bettered until the chequered flag. Giovinazzi tried his hardest to beat his teammate’s time but had to settle for P2, two tenths adrift of Gasly. Eighteen minutes into the session, there was a short yellow flag period as the Frenchman ran a bit wide and spun off into the gravel bed at Turn 12. He re-joined the track safely whilst Giovinazzi improved on his personal best and closed the gap to 0.082s. Halfway through the session, all of the drivers came into the pits for fresh tyres. When the action picked up again and with less than four minutes left on the clock, Evans locked up the rears which sent him into a spin and into the gravel bed before hitting the tyre wall in sector 2. The session was red-flagged to retrieve the damaged Pertamina Campos Racing car as Evans safely walked away. At the re-start there were three and a half minutes left in the session. The drivers dove onto the track to try and improve on their laptime. Unfortunately, their efforts were ruined as seconds before the flag dropped Matsushita spun to a stop at Turn 14. The yellow flags were out and Gasly could saviour a fourth pole position, his second in a row. In P2, Giovinazzi enjoyed his fourth front row start while Marciello took P3, his best qualifying result since Hockenheim. Sirotkin, Matsushita, Alex Lynn, Nato, Jordan King, Oliver Rowland and Artem Markelov completed the top ten.